I keep several bottles of Torani flavoring syrups around for emergency middle of the afternoon latte’s and found they work well for flavoring frostings and other goodies too. In these cupcakes the white chocolate syrup keeps the frosting light and fluffy, instead of dense and heavy, as real white chocolate tends to do. With this one bowl method cupcakes are easier and make for fewer dirty dishes. 1. Place 24 cupcake liners in two cupcake tins. Preheat oven to 350 degrees. 2. In a stand mixer, beat together shortening, sugar, vanilla extract, and salt. Add eggs and coco powder and beat until combined. Slowly mix in water. Add baking soda and flour and mix slowly at first, then faster until the mixture comes together. Fill tins half full using a cookie scoop. 3. Bake cupcakes for 20 minutes or until a toothpick comes out clean. Cool completely on wire racks. Yield 24 cupcakes. Prep time 15 minutes. Bake time 20 minutes. Flavoring syr up gives all the flavor of white chocolate without making the frosting too dense. 1. With a mixer, slowly beat together all the ingredients. Once combined, turn the mixer to high and beat for 3 minutes until fluffy. 2. Fit a pastry bag or gallon size bag with a Wilton tip 1A. Fill with frosting and pipe in large spirals around cupcakes squeezing at the top for a head. Let cupcakes set for 15 minutes. 3. Make eyes with sparkle gel by holding the bottle against the frosting. Squeeze gently and release. Slowly pull away from the frosting. Repeat with remaining cupcakes. If using, press plastic spiders into frosting to decorate. Yield 5 cups. Prep time 7 minutes. Recipe from Yum Food and Fun for Kids, October 2010 by Laura Flowers. 4 sticks of unsalted butter?? Other than that, these are cute, cute, cute. I wish I weren't so poopy about baking. I'd whipped them up and eat a huge portion of them and then feed the rest to my grand niece and the homeless. Wonderful! Butter or not they sure are cute! Lol Janell! There are 4 sticks of butter because this recipe needs a ton of frosting to pipe the ghosts. If you're just frosting across the tops cut it in half. These are the darned cutest Halloween cupcakes I've ever seen! You are not only a supberb photographer, but a talented and creative baker! Adorable! Can I please get an invitation to your Halloween party? These would be such a hit! Thank you for sharing...you are such a creative baker. I need to jump on the Halloween cupcake train! These are the most adorable ghosts ever!!! I wonder if my daughter is baking for a Halloween party this year? Will have to send her this link so she can take a peek. I cannot get over how precious these little ghosts are. Another fabulous idea, of course. aww these look so pretty:) thank you for sharing this. have a nice weekend. I'm so happy to hear that we share common things in our lives with our mothers. I almost feel guilty to claim she hated to cook, maybe because my grandmother was a fabulous cook. You and I probably share our independence from our moms'. Thanks for your kind comments! Adorable! I love the ghosts :) And the one bowl recipe...the fewer dishes I dirty, the better! Absolutely adorable! Love those little ghosts. Super cute. I make a lot of cupcakes for my blog and I LOVE these! My office is having a Halloween cooking contest, and I think I just found what I am making for it! Oh, my goodness! These are adorable! 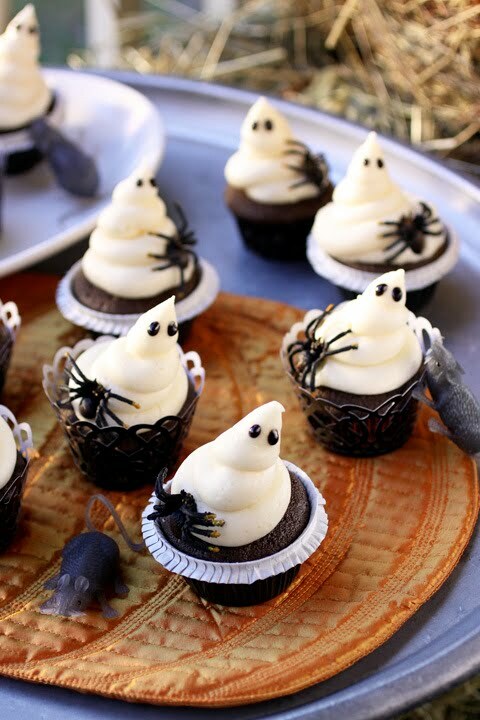 What great & sweet little ghostly cupcakes! 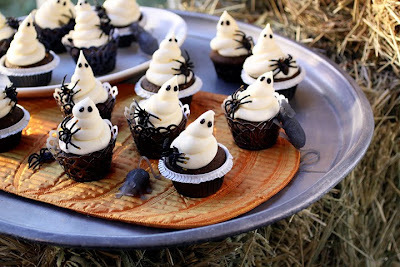 These ghost cupcakes are so crazy cute!! Love 'em & I bet they taste amazing too. So, so darling! I saw these on either FoodGawker or Tastespotting yesterday...yay!!! PS...I just bought my first ENTRY level dSLR. Will you come to TX and give me private lessons? ;) Oh, and feel free to bring these cupcakes! Bridget my friend I would love to visit and give you camera lessons if you give me cookie decorating lessons! So cute! The spiders are a great touch, too. The cupcake holders are lovely too- where did you find them? I found them at Michael's in their cake decorating section. They had all kinds of fun stuff. Ooo now I want to go shopping. Yikes! Thanks for stopping by Welcome To My Kitchen. I would like to feature your favorite recipe with a photo on my site. I will write a post about your blog. you can contact me on my blog if interested by the contact button and it will go to my email.I love your site its great! Sophia thank-you for the contest info. That was really nice of you! Absolutely spectacular! L-O-V-E it!! Looks like you are ready for Halloween! !